Okay, okay, there is no such thing as a peaconut, or toodles, but I thought it sounded cool. SO, I present to you Peanut and Coconut Tofu with Noodles. This is a quick and easy dinner using Asian flavours and simple ingredients. This means you don’t need to go out and buy loads of ingredients from the supermarket, plus the sauce is made using everyday store cupboard essentials. Despite this, you may struggle to find tofu puffs if you aren’t close to a Chinese supermarket. No fear, just fry off some tofu yourself prior to cooking the dish. For silken tofu, try deep frying to maintain it’s shape. With firm, you can simply shallow fry. 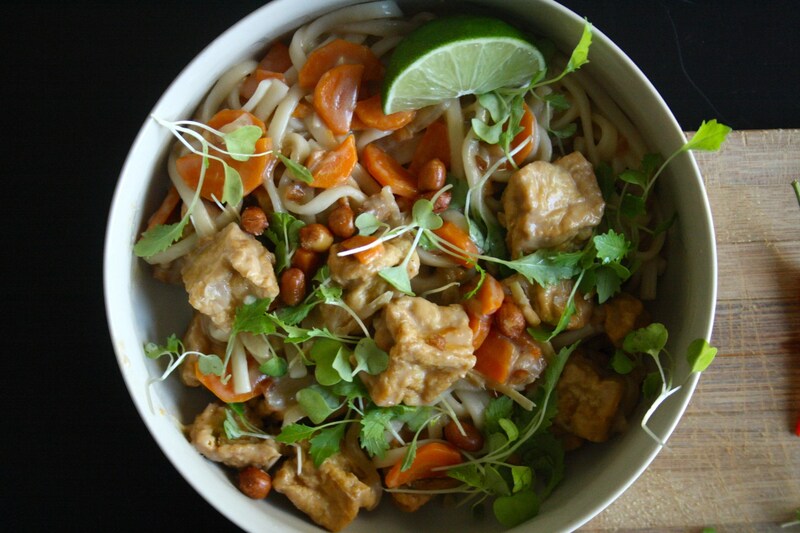 If you love the combination of peanuts, coconut, and tofu as much as I do, then you’ll love this dish! It is fresh, creamy, zingy, with an additional optional chilli kick.